Do Bourdain’s Wives Really Choose Obscurity? Apologies to Alan Jay Lerner, but… When Bourdain’s in Spain, he must think wives are a pain. 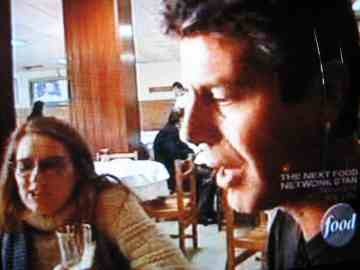 After watching No Reservations in Spain, it appears that Ottavia Bourdain has either developed “Nancy Syndrome” when it comes to appearing on camera, or she’s the second woman to be deliberately pushed into the background by Anthony Bourdain’s ego. During that scene, the other man spoke to Nancy, and you could hear her mumbling, but she was never identified, and it was edited so Tony seemed to ignore her. Now he’s back in San Sebastian with Wife No. 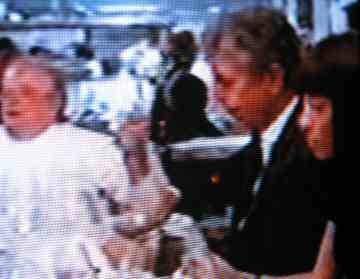 2, Ottavia, and it was déjà vu as he dined in the last scene with his friends Juan Mari and Elena Arzak at their restaurant. His tablemates looked at and spoke to Ottavia, and even included her in their toast, but shots of Tony were tight so he appeared to be sitting alone. But then a telltale plate of food was served beside him, and the mysterious diner even said something unintelligible. And then as the credits rolled, Ottavia got her “Nancy moment” on the edge of the frame. For the rest of the episode, he wandered around alone with various female guides. Just about two years ago, when Ottavia and Tony’s love was new, Ottavia appeared prominently in two NR scenes in Tuscany and he didn’t seem to mind. Since Bourdain was already famous when they met, it seems unlikely it’s Ottavia’s wish that his fans never see them together. If Tony’s trying to cling to his “free spirit” image, the cat’s out of the bag. We now know it wasn’t authentic from Day One. It always struck me as odd that, during his intro on Cook’s Tour, he said, “I’ve got nothing to lose,” when he had a wife sitting at home. That attitude probably didn’t help his first marriage. Now I wonder if he’s doing it again with Ottavia. If so, he’s wrong if he thinks female fans can’t accept him as a married globe-trotting rebel. What we aren’t crazy about is watching him diss his wives in crowded restaurants. This entry was posted on Friday, August 22nd, 2008 at 8:00 am and is filed under Bourdain, Travel, TV. You can follow any responses to this entry through the RSS 2.0 feed. You can leave a response, or trackback from your own site. 15 Responses to Do Bourdain’s Wives Really Choose Obscurity? I think the editing is deliberate. I for one do NOT want to see him holding hands with the child bride. I already resent her enough! However, the closer to vest he keeps his private life the more interesting it is. So a glimpse here and there becomes quite tantalizing. I really can’t wait to see the baby toddling about. Besides, it would be bad form to show-boat around with #2 when Nancy was so reclusive (whether by design or Bourdain mandate). It’s Tony’s show and that’s who I want to see and hear. Petunia, I’m with you. I think it’s really weird to let the wives be in the edges of scenes. Some time ago, on another post we discussed the possibility of him doing an episode with Ottavia. He’s done several with his brother, both on NR and A Cook’s Tour. When he did his 2007 Christmas special, he staged it at his brother’s house and excluded Ottavia and Ariane, although it was their first Christmas together as a family. I blogged at the time that I found that extremely odd. Wow–I know this is totally taking things out of context but Ottavia sure looks somber in that pic from the dinner! Iagree with y’all–she should be included–she is Italian after all so she has a non-american outlook on food–NR should take advantage! 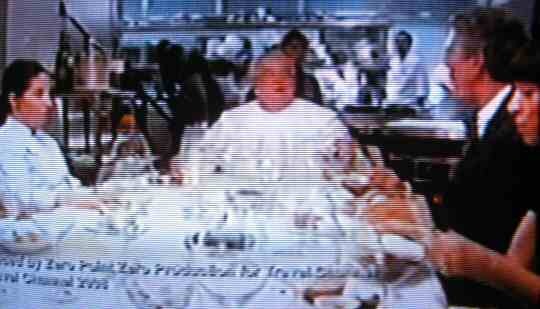 Yesterday they showed reruns of his show and I did see in the Spain episode where at the end they are having dinner with his friends and looks like at first there is no one sitting next to Anthony on the left of him but then Ottavia shows up when the food is served and she is not saying very much. Plus I wonder what his friends there thought about her. A Rethink on this whole wife in the shot thing……. Bear with me here…. Yes Tony has a private and a personal life, and as we know they do sometimes mix. He has a young daughter, who is by all accounts traveling with him and his wife. This is a good and Noble thing. I by no means am saying that its good to raise a child on the road but its always good to have family close. Having said that, the man has a JOB. Anyone that has read anything about Tony is that he doesn’t miss work, its an easy gig after cooking but it is his work. Life on the road is tough, by all accounts it killed him and Nancy. Maybe he is trying to keep things in this relationship stable by sharing experiences. But the babe in arms sounds like its eating the world over. When Ariane gets old enough to realize what’s going on around her, I think she’ll have an amazing life as Bourdain’s daughter if he’s still got his traveling gig. And as Ottavia accompanies him today, I hope they’re bringing Ariane along so she gets used to being on the road. Much as we joke about Ottavia’s youth, from what little we’ve seen of her (aside from that Miami Ink skull tattoo thing) she does seem down-to-earth and a good influence on Tony. I can only assume that she’s a devoted mother and Ariane will thrive. Deborah, I’m not a mother, so I can’t be sure about this, but I think the pictures of Ariane, even on the Christmas card, seem to have been taken a while ago. Now that she’s getting older, Bourdain seems to be keeping her face away from the camera, for which I don’t blame him. You never know what crazies are out there. With Ottavia, though, the cat’s out of the bag. We’ve seen her enough to pick her out of a crowd. I’m a fan, a big fan. I even watch episodes that I’ve already seen. If Tony needs a “stand in”, my husband looks exactly like him. Or, as my hubby would say, “Anthony looks like me. I’m 2 yrs older.” Anyway, I’d love to see an episode with his baby daughter. Wouldn’t we all like to see Tony being a papa? Too sweet? I think not. Rose, you may be getting your wish on September 14. Bourdain’s got a new No Res coming in Sardinia that he says they have dubbed the “Meet the Fockers” episode. I think it includes his Italian in-laws, so if we don’t get a good look at Ottavia and Ariane, I will be very surprised. Bourdain’s wives don’t choose obscurity…Tony chooses for them. It’s all about him; he doesn’t like to share. So just who are you Miss Milque Toast. Inquiring minds do want to know, you seem awfully bitter, I am sure that you must have better things to do in your evening than haunt this lowly blog and run people down anonymously. Tell the world, does Tony owe you Money??? Is he the father of your love child??? Or are you just someone with an axe to grind looking for an outlet??? In any case if you did or do know him, put down the knife and spill the beans. Oh, so she is Italian. That figures. Italians pretty much create the book on rawness and passion. Best lovers I ever had in my life, bar none. Welcome, Beth. Yes, Ottavia is Italian. Her father is from Sardinia and her mother is from the Lombardy region. You can see ALL of them in the Sardinia episode, which was the last episode of Season 5, which just wrapped up. It’s probably being rerun on the Travel Channel a lot between now and the new year when Season 6 starts.